Growing preference for lubricating grease in automotive and mining industry helps in the growth of the grease cartridges market. Cartridges reduce human efforts while applying grease for machinery parts. Consumers are moving towards convenient products for lubricating. Manufacturers come up with various innovations lubricant packaging solutions out of which is plastic cartridges which are expected to witness a shift in demand from fiberboard cartridges. According to the latest market report published by Transparency Market Research titled “Grease Cartridges Market: Global Industry Analysis, Size, Share, Growth, Trends and Forecast, 2018–2026,” 14oz capacity segment is anticipated to be the highest contributors to the global grease cartridges market, over the forecast period, 2018-2026. 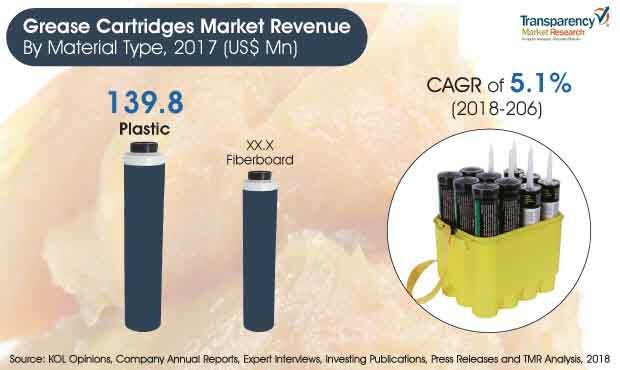 Globally, the revenue generated from sales of grease cartridges has been estimated to be over US$ 257,085.2 Thousand in 2018, and is projected to increase at a CAGR of 5.1% during forecast period. On the basis of capacity, 14oz grease cartridges segment accounts for the largest market share of grease cartridges market due to preference for this type of capacity in lubrication. On the basis of material type of grease cartridges, plastic segment is expected to dominate the market during the forecast period. On the basis of closure type, pull-off cap dominates the market of global grease cartridges market. APAC is estimated to account for the largest revenue share in grease cartridges market due to increasing demand for lubrication in automobile industry. MEA is estimated to contribute relatively less to the total market value, despite holding a possibility to exhibit a rapidly growing market share in the global grease cartridges market. Growth in grease cartridges market in Latin American region is expected to be moderate during the forecast period. The market players that have been profiled include - Fischbach KG, MBP Manufacture Bourguignonne de Plastique, Biederman Enterprises Ltd., Sonoco Products Company, Tubi System AB, Schieferdecker GmbH & Co. KG, Plastic Tooling Manufacturing Pty. Ltd., Long Thames Enterprise Co., Ltd., Andpak Inc. and Bev-Cap Pty Ltd. The report provides valuable insights on the key drivers and restraints, as well as the grease cartridges market trends. It also performs the impact analysis based on the average weighted model. Globally, the grease cartridges market has been segmented on the basis of capacity, material type, closure type, and region. The segmentation is as follows. Our reports are single-point solutions for industries to grow, evolve, and mature. Our real-time data collection methods along with ability to track more than one million high growth niche products are aligned with your aims. The detailed and proprietary statistical models used by our analysts offer insights for making right decision in the shortest span of time. For organizations that require specific but comprehensive information we offer customized solutions through adhoc reports. These requests are delivered with the perfect combination of right sense of fact-oriented problem solving methodologies and leveraging existing data repositories.